Amid War, Afghanistan Builds Its First National Park The Afghan government is working with Americans to create a park in the mountainous lakes region of Band-e-Amir. But it will be difficult to reach, and planners face other obstacles — both natural and manmade — to make it a reality. 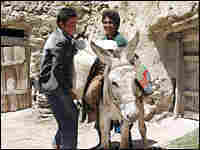 Donkeys are the main mode of transportation for villagers in the remote Band-e-Amir region, home to Afghanistan's first national park. In Afghanistan, Americans are working with the government in Kabul to create something that has never existed before in this war-ravaged country: a national park. It takes several hours by four-wheel-drive vehicle, riding on rocky roads that wind through mountains and across streams, to get to the 220-square-mile site. But the drive is easy compared to the obstacles planners face to make this park in central Bamiyan province a reality. Between mountains in the Hindu Kush range lie six, sky-blue lakes. 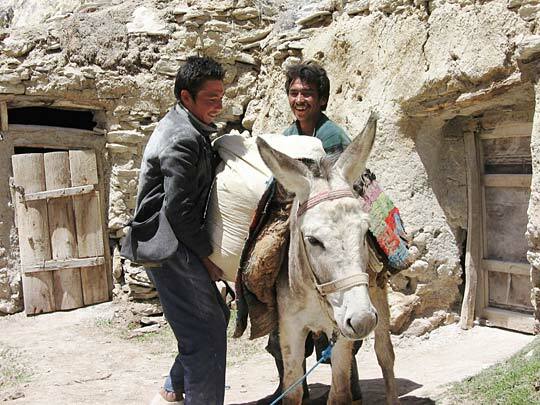 They are the lifeline of 15 villages, where people live pretty much as they have for centuries. The lake region and its many streams, called Band-e-Amir, boast some of the most beautiful landscape in Afghanistan — including crystal-clear waterfalls cascading over naturally formed dams that keep the lakes in place. Such natural wonders make Band-e-Amir the perfect place to create Afghanistan's first national park, says Bamiyan Gov. Habiba Surabi. "This is one of our desires ... that we at least will have something for the tourism attraction, the tourism destination here in Bamiyan," he says. Surabi and other Afghan officials have joined forces with the Wildlife Conservation Society, the U.S. Agency for International Development and other foreign donors to make the park a reality: not just as a tourist haven, but as a place where the country's fledgling conservation laws can take root. 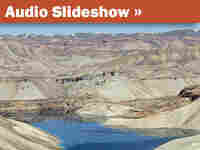 A planned, paved road will make Band-e-Amir more accessible, although it could take years to build. "There was a sense with the donor community, as well as the government, that this particular natural resource was something that was so attractive, desirable and generally worth protection that it needed to be made an example of," says Loren Stoddard, who directs USAID's office of alternative development and agriculture in Afghanistan. But there are problems in the effort to create a national park. Animal droppings are everywhere. Discarded plastic bags flutter about in the wind. Empty bottles also litter the area. Sayed Hussein runs a flour mill built three generations ago next to some waterfalls at one of the lakes. Like many other villagers, the 60-year-old is nervous about the proposed park. To him and many others across Afghanistan, conserving natural resources is a foreign concept. Natural resources are what they depend on to survive. Trees are cut down for firewood. Landscapes are turned into farmland and pastures used to grow food and raise livestock. Trash is hauled to the edges of one's neighborhood to be dumped or burned. Water is harnessed for consumption and power. So to Hussein, the waterfalls next to his mill aren't something beautiful to be gawked at, they are a way to power the heavy stone wheels that grind wheat into flour. He is reluctant to consider how he might change his life to make the park work. But villagers do get a say in what happens here. Decisions about the proposed park and its rules are in the hands of a committee that includes not only the government in Kabul and its Western advisers, but Band-e-Amir elders and other village representatives. Peter Smallwood, country director of the Wildlife Conservation Society, says the aim is for the park to be a homegrown one. It is to be a national landmark that benefits residents and tourists. "I don't think that our job here ... is to re-create an American park. And, in fact, other than gentle nudges, I don't really want to be saying, 'Here is the vision.' I want the vision to be grown from theirs," Smallwood says. So the park will likely have some features one doesn't usually see in the West, such as a Shiite Muslim shrine on a lakefront that will remain open. Even so, the committee's ideas for creating this park aren't necessarily popular with residents. Some accuse the Asian Development Bank, which built the park's first ranger station, of failing to pay the owner for the land. Others complain that the committee has yet to come up with a new location for the marketplace that was moved from the lakefront area last fall. A local teacher, Roghiah, says park planners should hurry up with a plan for the herders of sheep, goats and other livestock, who take their flocks to the lakes to drink and graze on nearby mountainsides. "Our entire livelihood depends on farming and livestock. But no one — not the government nor the committee — has given us any real assurance with regards to how we can continue living here," Roghiah says. American proponents of the park say those decisions must come from the Afghans themselves. Smallwood, of the Wildlife Conservation Society, admits it's slow-going for efforts such as getting the Afghan government to establish a general set of rules for protected areas. That's the last hurdle before the park officially opens. With the ongoing war against the Taliban elsewhere in the country, he and others say it is difficult to get the government to focus on protecting the environment. A Band-e-Amir park ranger, Sayed Zaher, says he and the other three rangers assigned to the park have not been paid in four months — since the government took charge of them from the Wildlife Conservation Society. But he adds that he believes in what he has been hired to do — and that he is having some success in getting fellow Band-e-Amir residents to cooperate with conservation measures.